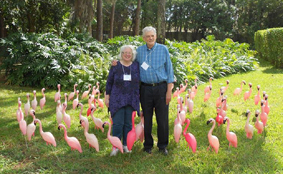 As a person who always seems to be in search of a metaphor, I was inspired to an insight by this photo of outgoing TLS president John Rhodes and incoming TLS president Kay Whipple standing within Lars Howlett's wonderfully-whimsical (and Florida-appropriate!) labyrinth. The Labyrinth Society is indeed a dance--both choreographed and improvisational--and though there are challenges, we all dance beautifully together! And what makes it work is our shared vision and our "radiant" leadership at all levels. "Passing the torch" represents the continuity of this warm and wise Radiance. And in this Light, we dance!